In order to figure out expenses, in many projects and production lines there is need for measure actual time spent for specific tasks. Human brain is not designed to measure time exactly. When we think back how long we have been performing a task, our brain tends to forget many aspects and activities and imagine those as one activity. So, we are about to estimate the time needed in future to be less than it actually will be. 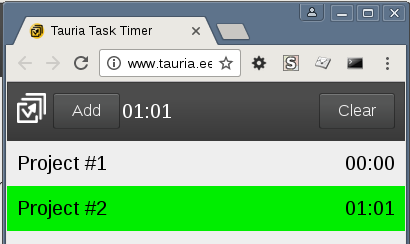 Tauria Task Timer is convenient tool for measuring actual time spent for activities. The measurements can be used to estimate time reservation needs. The application keeps all timing data inside browser’s cache memory and will not send the data over network. The application runs entirely inside browser and network is not needed after it has been loaded once. 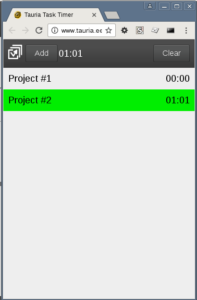 The left image shows main view of the application. The line with green background means the timer is running. By clicking on the number part of timer row, the timer will be stopped or started or running timer is changed: one timer is stopped and another timer is started. 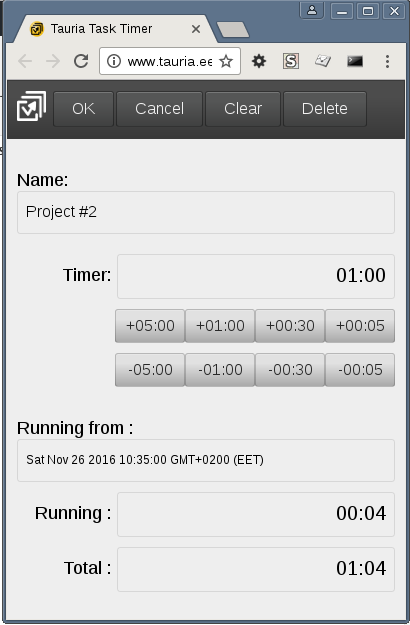 By clicking on the name part of the row, the right second view will be opened, where user can modify name of the timer, time it has been running so far using the + and – buttons. Also it will see when the timer has been last started and how many time it has been running from that point of time and total. Link to the time tracking tool. Salut, in sfarsit am aflat acest articol despre Time Tracking – Tauria OÜ. pe web-ul din Romania. multa bafta in viitor.